Book Island brings us the story of a young wolf who comes to realise that he isn’t as clever as he thought he was. He learns that we all need friends, especially if you are going on a long journey. Wisdom does indeed come from book learning, but it also requires the scholar to step outside the door and be prepared for an adventure. The book’s end papers are a narrative treat. 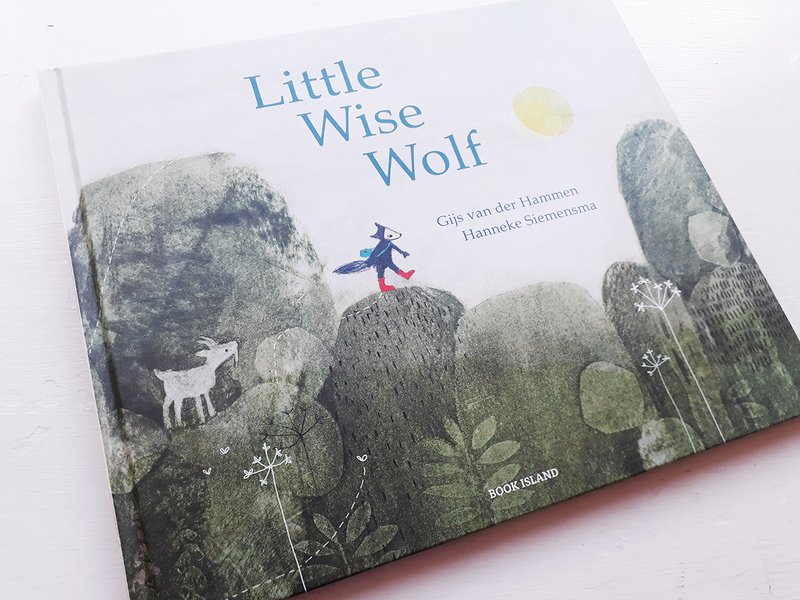 At the start we see only the natural environment, but by the conclusion we see the traces from Little Wolf’s marvelous journey. Little Wolf sits in his home absorbed in his many tomes, he has no time for others. The character is depicted as an absence of light, but this is a contradiction since he is supposed to be so enlightened. One day he is summoned by the King’s emissary, Crow. The King needs Little Wolf’s help as he is clever with herbs. Though reluctant to leave his studies he soon finds he has little choice. The are some wonderful spreads created by Hanneke Siemensma that depict the time and distances travelled. Little Wolf’s journey really feels epic and there are some impressive techniques used by the illustrator to set this scene. Liquid light shines out from the pages that are covered in a rich purple black. You can almost taste the ink on the pages. This work for me conjures up the spirit of Brian Wildsmith with its radiant and meticulous compositions including touches of primary colours. There is also some channeling of Jan Pienkowski’s work with its layering of strong graphic shapes over delicate backgrounds. 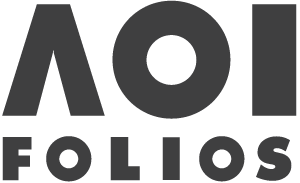 The artworks are a multi-media feast. Watercolour and masking fluid are carefully applied using gouache for opacity when necessary. Siemensma’s paintings contain wonderful details particularly when on foot or by bike as Little Wolf braves the weather, nights alone, ranging over mountains and through ravines. He moves from country to city; from closed mind to open mind; from selfishness to sharing. When he is offered the keys to the Kingdom he only wants to return to his new friends. 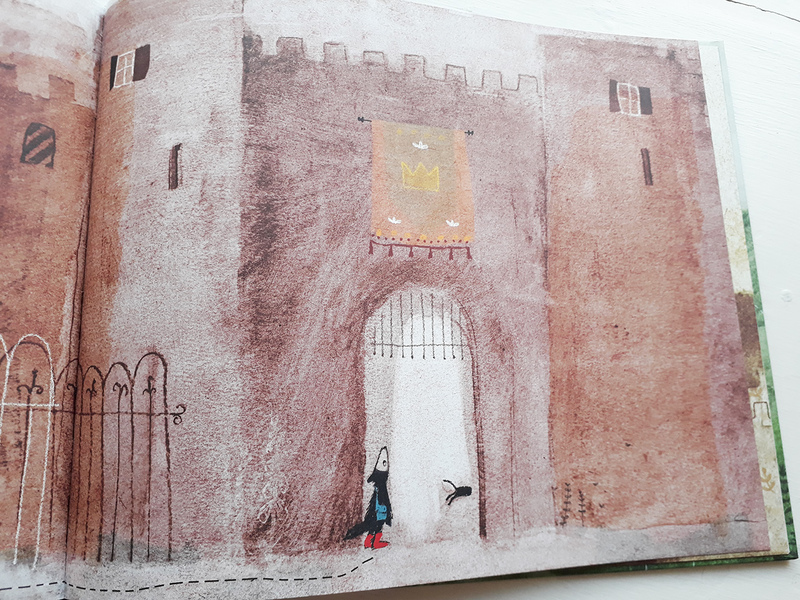 The initial spreads when Little Wolf is self-absorbed contrasts well with the final spread. Light glows from these pages, bathing all the woodland creatures with warmth and compassion. In this new world order Little Wolf is indeed wise.